with an empirical formula of C22H24N2O8H2O and a molecular weight of 462.46. 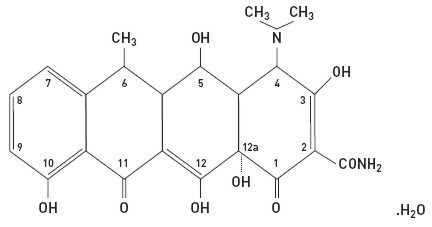 The chemical designation for doxycycline is 2-Naphthacenecarboxamide, 4-(dimethylamino)-1,4,4a,5,5a,6,11,12a-octahydro-3,5,10,12,12a-pentahydroxy-6-methyl-1,11-dioxo-, [4S-(4aÎ±, 4aÎ±, 5Î±, 5aÎ±, 6a,12aÎ±)]-, monohydrate. It is very slightly soluble in water. The safety and efficacy of ORACEA in the treatment of only inflammatory lesions (papules and pustules) of rosacea was evaluated in two randomized, placebo-controlled, multi-centered, double-blind, 16-week Phase 3 studies involving 537 patients (total of 269 patients on ORACEA from the two studies) with rosacea (10 to 40 papules and pustules and two or fewer nodules). Pregnant and nursing women, patients less than 18 years of age, and patients with ocular rosacea and/or blepharitis/meibomianitis who require ophthalmologic treatment were excluded from study. Mean baseline lesion counts were 20 and 21 for ORACEA and placebo patient groups respectively. Teratogenic effects1) Doxycycline, like other tetracycline-class antibiotics, can cause fetal harm when administered to a pregnant woman. If any tetracycline is used during pregnancy or if the patient becomes pregnant while taking these drugs, the patient should be informed of the potential hazard to the fetus and treatment stopped immediately. ORACEA should not be used during pregnancy (see PRECAUTIONS: Pregnancy). 2) The use of drugs of the tetracycline class during tooth development (last half of pregnancy, infancy, and childhood up to the age of 8 years) may cause permanent discoloration of the teeth (yellow-gray-brown). This adverse reaction is more common during long-term use of the drug but has been observed following repeated short-term courses. Enamel hypoplasia has also been reported. Tetracycline drugs, therefore, should not be used during tooth development unless other drugs are not likely to be effective or are contraindicated.3) All tetracyclines form a stable calcium complex in any bone-forming tissue. A decrease in fibula growth rate has been observed in premature human infants given oral tetracycline in doses of 25 mg/kg every 6 hours. This reaction was shown to be reversible when the drug was discontinued. 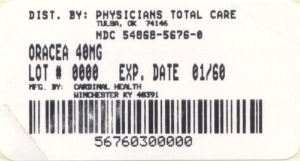 ORACEA (beige opaque capsule printed with CGPI 40) containing doxycycline, USP in an amount equivalent to 40 mg of anhydrous doxycycline. Bottle of 30 (NDC 54868-5676-0).